does anyone know what this cactus is called? Welcome to GOY. 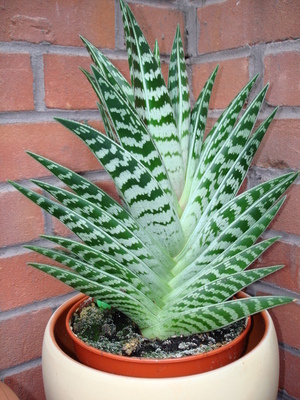 This is an Aloe variegata, commonly called 'Partridge Breast'. As Spitzhenry said, this is Aloe variegata. However, it is not a true cactus. Cacti have succulent stems, and spines that arise from a small tufted area like a little pin-cushion, called an areole. The flowers of a cactus usually arise from these areoles. Sorry to be so technical. I hope I haven't bored you. This Aloe looks a very healthy plant. thanks for the information! i actually gained quite alot of these plants over the last few year as new ones keep appearing! they produce flowers on long stems every year - even the ones i planted outside as they don't seem to mind the frost. i will have to add some more photos onto the website.